contemporary dining options, luxury bedding and functional work spaces for the perfect blend of upscale amenities to make every leisure and business traveler happy. Our health center, swimming pool and sauna provide the perfect rejuvenation after a long day of meetings. Also, our hotel near the Taj Mahal features high-speed Internet access throughout our property. As one of the newest hotels in Agra, our ultra-modern lodging provides attentive service and everything you could want for a comfortable stay. Known for our event venues and catering services, we boast unique function space for meetings or gatherings and on-site planners. 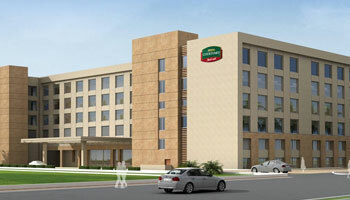 Whether you're traveling for business or leisure, the Courtyard Agra Hotel in Agra promises a refreshing experience. Backup Generator, Airport Transportation, Doctor on Call, Laundry Facilities, Travel Counter, Currency Exchange, Security Guard, Breakfast Services, Room Service, Parking. Attached Bathroom, Toothbrush/Razor on Request, Iron/Ironing Board, House Keeping, H/C Water, Air Conditioning Room, DVD Player, Wakeup Calls, Cable/Satellite TV.